Midcoast Maine offers endless opportunities for recreation. Whatever your favorite activity, the staff at New Meadows River Cottages can help you get the most out of your stay. Want us to arrange everything? Enjoy 12 miles of the protected waters of the New Meadows River and paddle alongside seals, osprey, eagles, and blue heron. 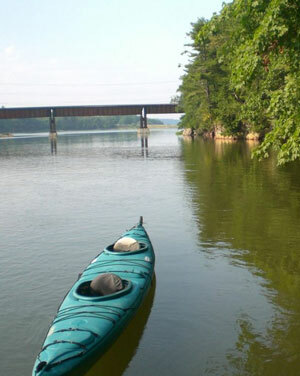 Rentals, instruction, and guided tours are available within walking distance at Seaspray Kayaking. Can we hook you on some great fishing? Maine’s Midcoast sports some of the world’s finest striped bass fishing. Stripers ranging from 24” to 48” and weighing up to 30 lbs spend their summers here. Shouldn’t you? We offer easy access to excellent seasonal fishing for stripers, bluefish and mackerel. We have room for boats and trailers if you choose to bring your own and a public boat launch on the New Meadows River a very short distance away. Or we can arrange a slip for you at the New Meadows Marina right next door. If you don't have your own boat, we can arrange a rental for you from the marina. Enjoy the power and beauty of traditional Japanese archery while staying with us. The New Meadows River Cottages is home to one of the few places in the United States where Zen archery can be studied. Classes are currently held once a week on Thursdays 5-7pm. Also check out these other local websites.